Sheila is an acclaimed fine-art photographer known for her photographic series Young Americans, Plastic Bodies, and Suburbia. She describes herself in the art world as a visual cultural producer portraying large-scale works that combine a wide-range knowledge of contemporary culture. Bright’s work is in the book and exhibition Posing Beauty in African American Culture. 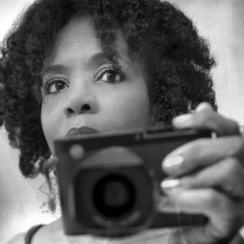 Also, Bright’s photographs appeared in the 2014 feature-length documentary Through the Lens Darkly: Black Photographers and the Emergence of a People. Her has been exhibited at the High Museum of Art, Atlanta; Smithsonian National Museum of African American Museum, Washington, DC; The Museum of Contemporary Art, Cleveland; The Art Gallery of Hamilton, Ontario, Canada and the Leica Gallery in New York. She is the recipient of several awards including Center Prize (2006). Her work is included in numerous private and public collections, to name a few; Smithsonian National Museum of African American History and Culture, Washington, DC, Oppenheimer Collection: Nerman Museum of Contemporary Art, Overland, KS, National Center for Civil and Human Rights, Atlanta, GA, The High Museum of Art, Atlanta, GA, The Museum of Contemporary Art, GA and The Library of Congress, Washington, DC and the University of Georgia, Athen, GA.
#1960Now series is now in the collection of the Smithsonian African American History and Culture Museum, Washington, DC; The High Museum of Art, Atlanta; The Center for Civil and Human Rights, Atlanta, GA; City of Atlanta, Mayor’s Office of Cultural Affairs and the Pyramid Peak Foundation, Memphis, TN. #1960Now book release is featured in the New York Times and she is included in the documentary film Election Day: Lens Across America.